Our perception of reality is something we take for granted. We believe something is real because we have been told that it is real. It has been "real" for generations. But what if the truth had been deliberately kept from us? What if the truth was so devastating and so bleak that those who were aware of it chose to protect us from it? My research supports the fact that a fundamental truth of our existence has been known by various secret groups throughout human history but denied to the majority of people because of its disconcerting nature. It was through researching the ancient African Dogon religion that I discovered the core mystery religion from which every other religion, including Christianity and Judaism, has evolved. The Dogon oral mystery religion is a disturbing truth which appears in ancient histories from all over the world, but it was only written down in 1946. According to the Dogon, there wasn't any intelligent life on the planet when the Nummo first appeared. The religion's lore suggested that the Nummos' world had been dying, which was why they took flight in their spaceships and ended up on Earth. The Nummo had planned to live on the Earth and combine their DNA with the animals they found here to create a new life form they could inhabit. What Dogon mythology tells us is that the Nummos' experiment failed. Not only was humanity born from this failure, but, as a result, humans became forever twinned to the alien Nummo. Nummo souls were lost in the experiment and beings that were once immortal became mortal creatures. They could no longer remember having lived before and forgot all association with their own kind. Evidence indicates that the Dogon mystery religion was the basis of the early Masonic societies, the Knights Templar, the Rosicrucians, and others. It is also associated with the secrets of the Merovingian dynasty, though not in the way that others have claimed. In Holy Blood Holy Grail, Lincoln, Leigh, and Baigent wrote that Merovingian kings became kings through sacred right on their twelfth birthday. They were priest-kings rather than ruling kings.3 These authors asserted that the objective of the Knights Templar was to protect the Merovingian bloodline because they believe that the Frankish royal family was descended from Jesus and Mary Magdalen. Other research on the Merovingians points, however, to beliefs that they were descended from alien beings who were the offspring of nephilim, or fallen angels. The Merovingians traced their ancestry back to one Mérovée, a semi mythical person who was born of two fathers, one a sea monster, the other, a king named Clodio.4 My research ties the ancestors of the Merovingians to the same alien beings, known to the Dogon people as the Nummo. 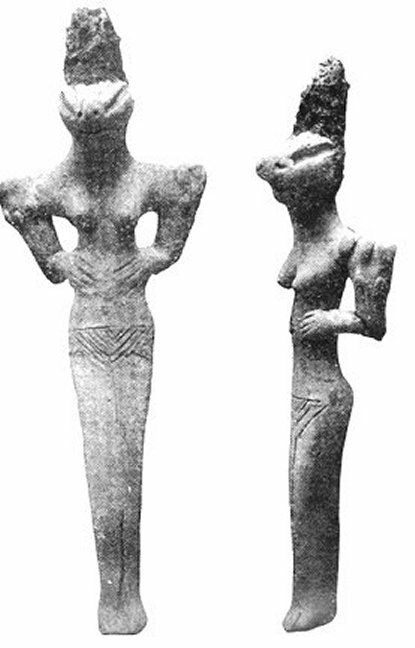 Ubaid serpent-goddess figures uncovered in Ur in southern Iraq, which date from around 4500 BCE and are shown above, depict the Nummo as they were described by Ogotemmêli. These figures came from prehistoric villages of the Ubaid culture that was named after a site near Ur explored in 1922.7 They have lines on their bellies that were described by Ogotemmêli, as being in two rows of short slanting lines that formed a series of V's without points.8 The statues also have strange bumps on the shoulders and elbows that are similar to the copper bracelets worn by Dogon people on their wrists and elbows. These bracelets represented the circular bones that extended from the skin at that part of the Nummos' arms.9 The Ubaid figures' bodies are streamlined like serpent's bodies but, like the Nummo, they also have fish tails. In the Dogon religion, the androgynous Master (Mistress) of Speech, who was half fish and half human, was regarded as the saviour of humanity. This individual, who was also known as the seventh ancestor, had the perfect combination of Nummo and human DNA. This individual was sacrificed so that all humans born afterwards would have the perfect DNA in their genetic makeup. This was to correct the mistake of the Nummos' first experiment and eventually allow all humans to find the immortality that had been lost to them. The fish has long been a popular Christian symbol. This suggests to me that the Master (Mistress) of Speech, a figure which according to my research predates Christianity, probably influenced the later Christian myth. In the Bible there are verses that tell that Jesus walked on water. The Pope's ring is known as the fisherman's ring, and on it is an engraving of the hall of fishes. In the Dogon religion, the fish-tailed Master (Mistress) of Speech was identified with the sacred feminine. I believe her characteristics were later blended with the male figure of Christ by the patriarchal fathers. In my book, The Nummo, I point to Mary Magdalen, whose name is said to come from her birthplace, Magdala Nunayya, "Magdala of the Fishes,"10 as perhaps being the original Master (Mistress) of Speech figure. Dogon mythology also appears in Greek myths, including stories about the gorgons and the goddesses Artemis, Athena, Demeter and Persephone. Because the Nummo were self-fertilizing beings, they did not need a mate to procreate, and this may have been the source of myths relating to virgin goddesses. They could also create life through genetic engineering experiments and regenerate those who were old or dying. 1Shannon Dorey, The Nummo. Elemental Expressions Ltd. p. 124. 2Marcel Griaule. Conversations with Ogotemmêli: An Introduction to Dogon Religious Ideas. Oxford University Press, London for the International African Institute, 1965. p. 188. 3 Michael Baigent, Richard Leigh and Henry Lincoln, The Holy Blood And The Holy Grail, BPCC Hazell Books, Aylesbury, England, 1990. p.253. 4Dan Burstein, Secrets of the Code, (CDS, New York, NY. 2004) p. 348. 5Marcel Griaule and Germaine Dieterlen, The Pale Fox, trans. Stephen C. Infantino, Ph.D. (originally published in French as Le renard pale, by L'Institute d'Ethnologie, Paris, 1965), Chino Valley, Arizona: Continuum Foundation, 1986, p. 508. 7Gordon Childe. New Light on the Most Ancient East. V. Routledge and Kegan Paul Ltd. London. First published in 1934. Revised 1952. p.13. 10http://www.newadvent.org/cathen/09523a.htm Magdala, New Advent. Catholic Encyclopedia. 11http://www.timelessmyths.com/arthurian/grail.html#FisherKing Timeless Myths 1999-2003. Jimmy Joe. If you would like to have an interview with Shannon Dorey please contact sd@themasterofspeech.com Follow this link if you would like to read a Sample Chapter of The Nummo.